I'll Push You: 500 miles, two best friends, and one wheelchair. “I’ll Push You!” Two friends. One Wheelchair. 500 Miles. 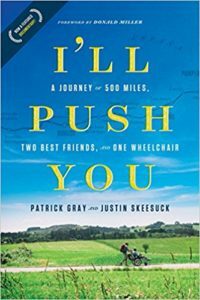 I’ll Push You is an up-close and personal look into the dynamics of a life-long friendship between two best friends – Justin Skeesuck and Patrick Gray – as they travel across El Camino de Santiago. Their documentary covers the struggle of the 35-day, 500-mile wheelchair journey across mountains, deserts, hills, and valleys and features perspectives from family and friends. 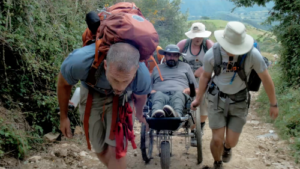 The story begins with the challenge that comes with Patrick’s willingness to push Justin in a wheelchair across northern Spain. I’ll Push You also explores the struggles related to Justin’s rare neurological disease. The parallel paths of Patrick’s experience in Spain and Justin’s life journey come together in a singular moment to reveal their similarities where Patrick discovers he’s both the pusher and the pushed.The story’s an inspiring example of love and vulnerability on display. Their trek in 2014 captivated individuals around the world. In addition, numerous media outlets such as The Today Show, Huffington Post, and Fox & Friends, have shared their amazing journey. Since returning from Spain, Justin and Patrick have been sharing their message of hope, faith, and community worldwide. Patrick and Justin called the show to talk about the upcoming documentary and their life-long friendship. In addition, Patrick shared insights he gleaned as a caregiver through this intense trip. Along the trail, Patrick wrestled with what virtually every caregiver struggles with: control issues. While they encountered many pilgrims along the Camino de Santiago, who offered to help, Patrick remained somewhat reticent. Eventually, however, they approached one stretch where the climb was so steep, that Patrick could no longer do it himself. Patrick recounts learning to let go of control. …To recognize there’s a group of people who can step in and do some things that I can’t do. My getting myself out of the way to allow people to do something I can’t do on my own, actually allowed both Justin and I to experience things we would have never experienced otherwise. At www.illpushyou.com you can see more about Justin and Patrick. In addition, check out the official trailer below.